Spring is here in Waterbury, and though we may experience a little bit more from winter, we are seeing the light at the end of the tunnel for warmer days and nights. 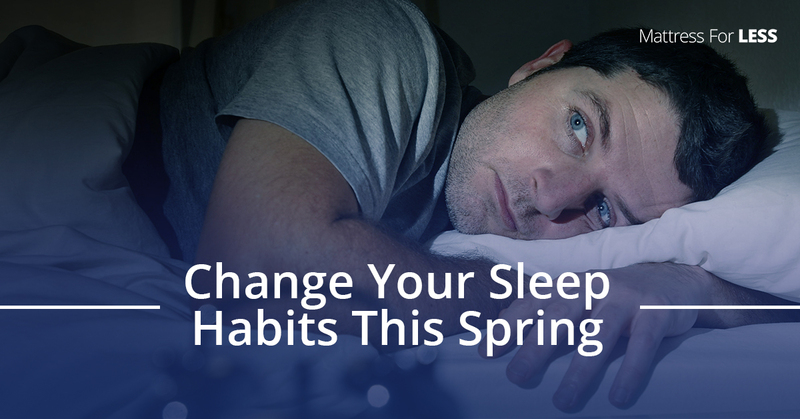 Often, during the springtime, we evaluate our habits or, at least, do some much-needed spring cleaning, cleaning out the dust and cobwebs that are proverbially hiding in our sleeping habits and maybe even our bedrooms. Today, on the Mattress For Less blog, we are going to talk about some habits to “clean out of your life,” as you prepare to get more and better z’s this spring! As a society, we are continually connected to our phones. We can’t go anywhere without them and even take them into the bathroom with us which is a little disconcerting when you think about the theory that our phones are actually listening to us. Regardless if this is true or not, most of us take our phones to bed with us and look at them right up until we turn out the lights, and even past that time. We understand how important it is to say “good night” to your sweetheart, but looking at your phone may be costing you sleep. Because the light from the computer screen is a bluish hue, our brains stop producing melatonin, the hormone that helps us sleep and thus, instead of powering down, our bodies are energized. Send that last text, check social media one last time, or peruse your email just once 30 minutes to an hour before you are hoping to get some shut-eye. We know. Food is wonderful, but sleeping with a mess of crumbs in your bed isn’t the only reason why you should stop munching before bed. Eating food right before you go to bed might be negatively affecting your sleep. Your digestive system is tightly connected to your sleep and when you start powering down, it isn’t expecting any more calories. Gastroesophageal reflux disease (GERD) or heartburn can keep you up all night if you eat the wrong thing and GERD can actually be connected to obstructive sleep apnea. If you must eat before bed, try to eat something small such as a cup of protein-rich Greek yogurt, cherries, or warm milk. Stay tuned for part two of our blog series for sleeping habits that need to be thrown out this spring with the winter dust bunnies, Dad’s broken tennis racket, and all those blazers with shoulder pads. Summer is just around the corner and it is time for you to get that shut-eye that you need so you can have all the fun that summer brings. If you’ve already kicked these harmful habits to the curb and are still having trouble sleeping then it might be time for a new mattress, Sleep For Less has just what the residents of Waterbury need to get a full night of sleep. We offer brand-name mattresses, as well as stylish headboards, fluffy or not-so-fluffy pillows, mattress protectors, and bedframes! Come into Mattress for Less for all your sleep-related needs!